MILW 261 on home rails!!! 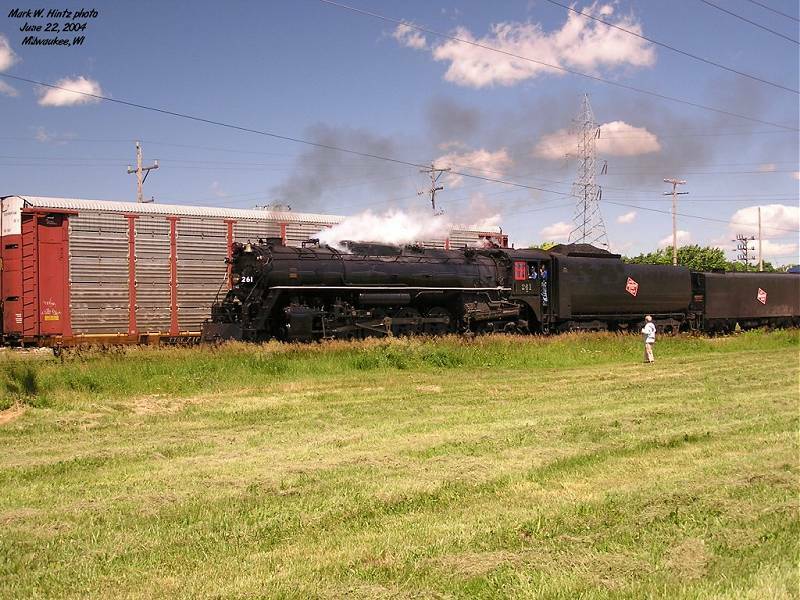 On June 22, 2004, Milwaukee was again visited by a steam engine, this time Milwaukee Road S-3 4-8-4 #261. This was 261's first trip since retirement and restoration on "home rails", the former Milwaukee Road, now owned by Canadian Pacific. I first waited at Waterford Avenue, then chased the train south to Pleasant Prairie. I tried chasing it farther, into Illinois, but lost it around US-41, since I wasn't sure where the tracks went. Click here to start viewing the album, or click a thumbnail to view a picture. Press F11 to toggle full-screen view (in most browsers). On June 21, 2006, Milwaukee Road 4-8-4 S-3 #261 once again visited its "home town" for a series of excursions over the following weekend. Operating as an Amtrak train, it made all of the normal Amtrak stops along the line between Minneapolis and Milwaukee. 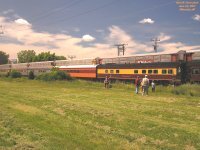 Fans and spectators lined the route, and many cameras and video and audio recorders captured the steam engine and its beautiful consist of passenger cars, including recently-repainted Super Dome #53 and Skytop observation Cedar Rapids. The train tied down on track 4 at the Milwaukee depot Wednesday night, as it got ready for dinner train service Friday evening. 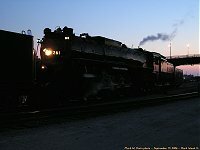 Friday night's dinner train departed the Milwaukee depot shortly after 18:00, a little late due to a certain notable guest. I waited for the train near the old Frank's Kraut plant in Franksville, where the lighting was ideal to take pictures of the steam engine and its train. After the kraut factory photos, I headed down to Sturtevant to watch the train turn on the wye, actually part of the branchline to Union Grove and Kansasville. This line was once known as the Racine & Southwestern, and went as far as Savanna, IL, though today the line is in pieces, with many of the gaps having become bicycle trails. For my final dinner train shots, I headed up to the new Sturtevant depot. I decided to wait just to the west of Main 2 on the pedestrian overpass, which was full of people waiting for the steam engine! 261 put on a wonderful show for us. Saturday I was working, but on my way between job sites I decided to stop down in the Menomonee Valley to get a few more photos. While most people opted to get pictures from the Canal Street west bridge or ground level below the east bridge, I decided to get my pictures from the Hank Aaron Trail on the east bridge. Milwaukee Road #261 was a wonderful visitor to Milwaukeeland for the weekend, and put on a great show for all of us that turned out to see it! I would like to thank Canadian Pacific Railway and Amtrak for hosting the steam train, and The Friends of the 261^ for maintaining their beautiful equipment to the highest of standards. 261 was out on the rails again in September 2006, as part of RiverWay 2006 in the Quad Cities. Initial plans were for 261 to power the excursions, but things changed a bit when Rail Development Corp., parent company of Iowa Interstate Railroad, imported a pair of 1980s-built class QJ 2-10-2s from China. Plans were then to run the QJs on the excursions, while 261 stayed home. The final plans, however, made things all the more interesting -- the 261 group had some trouble with transporting their passenger cars down to the Quad Cities, and decided to run them down with 261, while the QJs would power the excursions. Of course, three working steam engines in the Quad Cities provided the potential for a real rarity: a steam triple-header! Indeed, 261 was the third steam engine behind the QJs on the Saturday excursion! Additional photos can be found on IAIS QJ 2-10-2s 6988 and 7081.